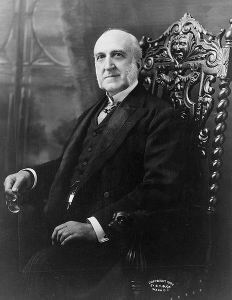 Depew Avenue is named in honor of Chauncey M. Depew [1834-1928], a statesman, U.S. Senator, counselor, orator, and President of the New York Central Railroad. It is not known where or when Depew and Lewis Jackson Bennett actually first met, but the two were undoubtedly familiar with each other in light of their respective business and political activities in the late 1800s. Depew attended Yale, graduating in 1856... Depew studied law and was admitted to the bar in 1858. Like Bennett, Depew became involved in politics early in his career. Both were active members of the Republican party ... Indeed, Depew was a delegate at the 1856 Republican Party convention. Like Bennett, Depew was a staunch supporter of Abraham Lincoln in the 1860 election. While Bennett was an elected official in Johnstown and was appointed as the collector of toll for the Erie Canal in Fultonville in 1861, Depew was serving as a member of the New York State Assembly. In 1863, Depew became Secretary of State for New York State. In 1866, Depew turned down a second term of Secretary of State and went back into private practice as attorney for the New York & Harlem Railroad. Subsequently Depew became associated with Cornelius Vanderbilt and eventually was named President of the New York Central Railroad and various smaller railroads Under Depew's direction, the New York Central Railroad system greatly expanded. Bennett and Depew had a Buffalo connection as well. It is possible that Bennett and Chauncey Depew met through William B. Depew, Chauncey's brother who moved to Buffalo in 1864. William Depew moved to Western New York (two years earlier than Bennett) to manage affairs for various railroad enterprises. Inasmuch as Bennett's company was responsible for building many of the iron bridges used by the railroads in Western New York, he and William Depew were certainly acquainted. Depew's nephew was Ganson Depew, a vice president of the Buffalo & Susquehanna Coal Company, and the personal assistant of his father-in-law Frank Henry "F.H." Goodyear. Special thanks to Barbara Townsend for sharing her knowledge about Central Park.